RUN TIME: 01 hr : 18 min : 26 sec. 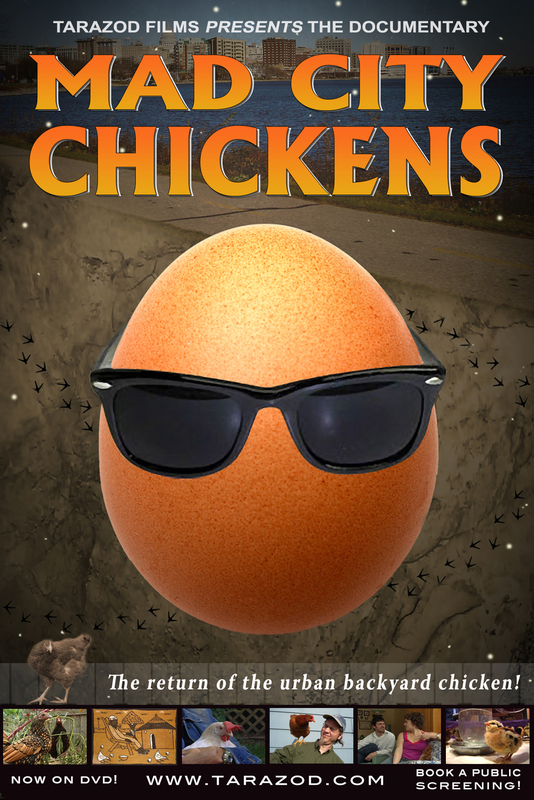 SYNOPSIS: Mad City Chickens is a sometimes serious, sometimes whimsical look at the people who keep chickens in their urban backyards. From chicken experts and authors to a rescued landfill hen and an inexperienced family that decides to take the poultry plunge--it’s a humorous and heartfelt trip through the world of backyard chickendom. Even a mad professor and a giant hen get into the act! TAGLINE: The return of the urban backyard chicken! ~October 2, 2016 - Minot, North Dakota - Public Screening presented by citizens of Minot - 6:00 pm at All Saint's Episcopal Church, 301 Main Street South. Free admission. ~June 17, 2016 - Minneapolis, Minnesota - Public Screening presented by Transition Longfellow - 6:30 pm potluck, 7:15 pm movie at Bethany Lutheran Church, 3901 36th Ave S. Free with donation. ~March 16, 2016 - Thunder Bay, Ontario - Public Screening presented by Thunder Bay Environmental Film Network - 7:30 pm at the Maple Tops Activity Center, 24 Court St. South. ~March 2, 2016 - River Falls, Wisconsin - Public Screening presented by activist Robert Ebert - 7:00 pm at the River Falls Public Library, 140 Union Street. ~April 20, 2015 - Ames, Iowa - Public Screening presented by Wheatsfield Co-op - 7:00 pm at the co-op, 413 Northwestern Ave.
~April 11, 2015 - Irving, Texas - Eco-Film Festival presented by City of Irving Office of Environmental Stewardship - 4:00 pm at West Irving Library, 4444 W. Rochelle Rd. ~April 4, 2015 - Sturgeon Bay, Wisconsin - Public Screening presented by Crossroads at Big Creek - 1:00 pm, 2041 Michigan St.
~November 1, 2014 - Tecumseh, Michigan - Public Screening presented by Tecumseh Backyard Chickens. ~September 24, 2014 - Phoenix, Arizona - Public Screening presented by Valley Permaculture Alliance - Arizona State University. ~August 12, 2014 - Peterborough, Ontario - Outdoor Screening presented by Nourish - Doors open at 8:00 pm; film starts at 8:30 pm at YWCA parking lot, 216 Simcoe St.
~June 5, 2014 - West Chester, Ohio - Public Screening presented by Backyard Chickens of West Chester - 5:30 pm at Midpoint Library, 9363 Centre Pointe Dr.
~May 15, 2014 - Sun Prairie, Wisconsin - Public Screening presented by the Sun Prairie Public Library - 6:30 pm at the library, 1350 Linnerud Dr.
~April 25, 2014 - Belgrade, Montana - Public Screening presented by the Backyard Chickens of Belgrade - 7:00 pm at the Belgrade Community Church. ~April 19, 2014 - Sturgeon Bay, Wisconsin - Public Screening presented by the Door County Public Library - 3:00 pm at the Crossroads at Big Creek, 2041 Michigan Street. ~February 11, 2014 - Ames, Iowa - Public Screening presented by the Wheatsfield Cooperative - 7:00 pm at the Co-op, 413 Northwestern Ave., East Space. ~January 28, 2014 - Palm Springs, California - Public Screening presented by the Palm Springs Public Library and the City of Palm Springs Office of Sustainability - 6:30 pm in The Learning Center, Palm Springs Public Library, 300 S. Sunrise Way, on the corner of Baristo and Sunrise. ~January 25, 2014 - Springfield, Illinois - Slow Food Film Festival presented by Slow Food Illinois - 6:30 pm at Benedictine University, 1500 N. 5th Street. ~July 25, 2013 - Jacksonville, Florida - Public Screening - 7:15 pm at the Sun-Ray Cinema, 1028 Park Street. ~July 8, 2013 - Pierre, South Dakota - Public Screening presented by the Pierre Urban Chicken Reform - 7:00 pm at the Capital University Center, 925 E Sioux Ave..
~June 19, 2013 - Surrey, British Columbia - Public Screening presented by the Village Surrey Transition Initiative - 6:00 pm at the Surrey City Centre Library, 10350 University Drive. ~May 12, 2013 - Cloverdale, British Columbia - Public Screening presented by the Chickens for Langley, BC - 4:00 pm at the Clova Cinema, 5732 176th Street. Screening is a fund-raiser for the local 4H club. ~May 10, 2013 - Virginia Beach, Virginia - Public Screening presented by 4 Virginia Beach Hens - 7:00 pm, Advanced Technology Center, 211 Expressway Ct.
~April 30, 2013 - Columbus, Indiana - Public Screening presented by the Columbus Food Co-op - 7:00 pm, YES Cinema, 328 Jackson Street. ~April 10, 2013 - Ledyard, Connecticut - Public Screening presented by the Friends of the Ledyard Libraries - 7:00 pm, Friendship Church, 384 Colonel Ledyard Highway. ~April 4, 2013 - Cockeysville, Maryland - Farm Fresh Flicks Film Series presented by the Maryland Agricultural Resource Council (MARC) - 5:30 pm, Baltimore County Center for Maryland Agriculture and Farm Park, 1114 Shawan Road. ~March 23, 2013 - Center Sandwich, New Hampshire - Public Screening presented by the Agriculture Commission - 1:30 pm at S.H.Wentworth Library, 35 Main Street. ~March 19, 2013 - Oregon, Wisconsin - Public Screening presented by the Oregon Public Library - 6:30 pm, 256 Brook Street. Part of the Green Tuesdays Film Series. ~March 7, 2013 - Belleville, Wisconsin - Public Screening presented by the Belleville Public Library - 7:00 pm, 130 S. Vine Street. ~February 8, 2013 - Palatine, Illinois - Public Screening presented by the Village Homesteaders of Palatine - 7:00 pm at CCUU, 1025 N. Smith St.
~February 6, 2013 - Laconia, New Hampshire - Public Screening presented by the Lakes Region Food Network - 6:30 pm at Laconia Public Library, 695 Main St.
~January 31, 2013 - Revelstoke, British Columbia - Public Screening presented by the North Columbia Environmental Society - 7:00 pm at Revelstoke Community Centre, 600 Campbell Ave.
~January 28, 2013 - Rapid City, South Dakota - Public Screening presented by Dakota Local Food Network - 7:00 pm at Elks Theater, 512 6th Street. ~January 26, 2013 - Rome, Georgia - Public Screenings presented by Claremont House Bed and Breakfast - Three screenings, 4,7 & 9:00 pm at the Rome Area History Museum, 305 Broad Street. Advanced tickets available at the B&B (706-291-0900). ~December 1, 2012 - Mundelein, Illinois - Public Screening presented by Village Homesteading Mundelein - 5:00 pm at Maverick's Bar & Grill, 2061 W. Maple Ave.
~October 27, 2012 - Burlington, Vermont - Vermont International Film Festival - 4:00 pm at Echo Lake Aquarium & Science Center, 1 College Street. ~October 26, 2012 - Kimberley, British Columbia - Public Screening presented by Wildsight Kimberley/Cranbrook branch - 7:30 pm at Centre 64, 64 Deer Park Avenue. ~October 25, 2012 - Cranbrook, British Columbia - Public Screening presented by Wildsight Kimberley/Cranbrook branch - 7:30 pm at the College of the Rockies Cranbrook. ~October 24, 2012 - Laconia, New Hampshire - Public Screening presented by Lakes Region Food Network - 6:30 pm at Prescott Farm Environmental Education Center, 928 White Oak Rd. ~October, 20, 2012 - Riverdale, Maryland - Public Screening presented by the University of Maryland Extension - 2:00 pm U of M Center for Educational Partnership, 6200 Sheridan St.
~September 9, 2012 - Ashland, Oregon - Food For Thought film series (Eat Local Week) presented by Thrive - 4:00 pm at Ashland Community Center, 59 Winburn Way. ~August 22, 2012 - Moorhead, Minnesota - Public Screening - 6:00 pm at the Moorhead Public Library, 118 5th St S.
~July 19, 2012 - Xenia, Ohio - Public Screening presented by the Xenia Chicken Underground - 2:00 pm at Xenia Community Library, 76 East Market Street. ~July 6, 2012 - Schroeder, Minnesota - Public Screening presented by the Sugarloaf Cove Nature Center - 7:00 pm at the nature center, 9096 Hwy 61 (milepost 73.3). ~June 20, 2012 - East Troy, Wisconsin - Public Screening presented by the Michael Fields Agricultural Institute - 7:00 pm at the Institute, W2493 County Road ES. ~May 16, 2012 - Ames, Iowa - Public Screening part of the Other Voices/Other Views film series. Presented by the Alliance for Global Justice-Ames - 7:00 pm Ames Public Library, 515 Douglas Ave.
~May 6, 2012 - Carbondale, Illinois - Outdoor Screening presented by Farmer Tom - Guests encouraged to arrive by 7:30 pm, film starts at sundown. Rain or shine at Mulberry Hill Farm, 5370 Springer Ridge Rd. Bring a lawn chair or blanket to sit on. ~April 29, 2012 - Beloit, Wisconsin - Public Screening presented by the Beloit Backyard Chickens - 5:00 pm, Bushel and Pecks, 328 State Street. ~April 22, 2012 - Saskatoon, Saskatchewan - Environmental Film Festival presented by the Saskatchewan Eco-Network - 12:00 pm, The Roxy Theatre, 320 20th St. West. ~April 22, 2012 - Regina, Saskatchewan - Environmental Film Festival presented by the Saskatchewan Eco-Network - 4:00 pm, Royal Saskatchewan Museum, 2445 Albert Street. ~April 18, 2012 - Minneapolis, Minnesota - Public Screening presented by Curt McNamara - 7:00 pm, Minneapolis College of Art and Design (MCAD), Auditorium 150, 2501 Stevens Ave. S.
~April 13, 2012 - El Cerrito, California - Environmental Film Series presented by the City of El Cerrito Environmental Quality Committee - 7:00 pm, El Cerrito City Hall. ~April 3, 2012 - Spartanburg, South Carolina - Public Screening presented by Hub City Co-op - 7:00 pm, Green Screen at The Showroom, 149 South Daniel Morgan Ave.
~March 15, 2012 - Lakewood, Ohio - Public Screening presented by Hens in Lakewood - 7:00 pm Lakewood Public Library, Main Branch, corner of Arthur and Detroit Avenue. ~March 15, 2012 - York, Pennsylvania - Public Screening presented by York College. The showing will be held at 7:00 pm Humanities 218, York College. ~March 3, 2012 - Austin, Texas - Public Screening presented by the Urban Poultry Association of Texas, Inc. - 7:00 pm, Callahan's General Store, 501 Bastrop Hwy. Showing is a warm-up for the Funky Chicken Coop Tour the following month. ~February 28, 2012 - Gainesville, Florida - Cinema Verde Environmental Film and Arts Festival - 4:00 pm Villa East, 301 N. Main Street. Chicken author Christine Heinrichs (who's in the documentary) is scheduled to attend. It will be kicking off a day of food themed films. ~February 26, 2012 - Branford, Connecticut - Public Screening presented by Audubon Connecticut - 2:00 pm Blackstone Memorial Library, 758 Main Street. ~February 23, 2012 - Delaware, Ohio - Public Screening presented by Sustainable Delaware Ohio - 7:00 pm Delaware City Art Center, East Winter Street. ~February 16, 2012 - Arlington, Virginia - Public Screening presented by the Arlington Egg Project - Doors open at 6:30 pm, Arlington Cinema and Drafthouse, 2903 Columbia Pike. ~February 12, 2012 - Madison, Wisconsin - Public Screening presented by the Wisconsin Public Television Garden Expo - 2:00 pm, Alliant Energy Center, 1919 Alliant Energy Center Way. The screening follows CLUCK book presentation by author Susan Troller and artist S.V. Medaris (both appear in the film). Plus the filmmakers will be present for a Q&A after the movie. ~February 2, 2012 - Sioux Falls, South Dakota - Public Screening presented by the Dakota Rural Action and Homegrown Sioux Falls - 6:00 pm Siouxland Main Branch Library, 200 North Dakota Ave.
~January 28, 2012 - Winona, Minnesota - Frozen River Film Festival - 10:00 am, 120 Science Laboratory Center, Winona State University and again at 6:00 p.m. in Miller Auditorium. ~January 19, 2012 - Windsor, Ontario - Public Screening presented by Windsor Essex Community Supported Agriculture - 7:30 pm Capitol Theatre, 121 University Ave W.
~November 28, 2011 - Phoenix, Arizona - Encore Public Screening presented by Desert Urban Gardens - 7:00 pm, FilmBar, 815 N. 2nd Street. ~November 20, 2011 - Edmonton, Alberta - Public Screening presented by River City Chickens - 3:00 pm Whitemud Crossing Public Library, 4211 - 106 Street. ~November 14, 2011 - Fort Atkinson, Wisconsin - Public Screening - 7:00 pm at the Fort Memorial Hospital auditorium, 611 Sherman Avenue East. ~November 9, 2011 - Sycamore, Illinois - Public Screening presented by the Sycamore Citizens for Backyard Chicken - 6:30 pm at the Sycamore Public Library, 103 East State Street. ~October 19, 2011 - Madison, Wisconsin - Wisconsin Book Festival - 8:00 pm at the brand new Union South Marquee Theater. Screening follows CLUCK book presentation by author Susan Troller and artist S.V. Medaris (both appear in the film). Free admission. ~September 24, 2011 - Billings, Montana - Public Screening presented by Magic City Hens - 6:30 pm at Harvest Church Lockwood, 1413 Rosebud Lane. ~September 23-24, 2011 - Edgerton, Wisconsin - Edgerton Sterling North Book and Film Festival - Edgerton Public Library, 101 Albion Street. The filmmakers will be on hand at the Friday night meet-n-greet (Edgerton Perfoming Arts Center) and at the Saturday library screening for a Q&A. ~September 18, 2011 - LaCrosse, Wisconsin - Public Screening presented by LaCrosse Public Library - 1:30 pm at the Library, 800 Main Street. ~September 10, 2011 - Madison, Wisconsin - Public Screening presented by Dane County Humane Society in conjunction with the Mad City Chickens Coop Tour- 2:00 pm at the Humane Society, 5132 Voges Road. Film follows tour, free admission, raffle prizes. ~September 9, 2011 - Johnson City, Tennessee - Public Screening presented by C.O.O.P. (Chickens On Our Property) - 7:00 pm Next Door, 415 W. Walnut Street. ~August 22nd, 2011 - St. Louis, Missouri - Public Screening presented by Slow Food St. Louis - 7:30 pm Schlafly Bottleworks, 7260 Southwest Ave.
~August 14, 2011 - Nelson, British Columbia - Public Screening presented by West Kootenay EcoSociety - 8:00 pm Lakeside Park. ~July 29th, 2011 - Chatham, New York - Public Screening presented by Chatham Real Food Market Co-Op - 7:00 pm at the Co-Op, 15 Church Street (Route 203). ~July 21st, 2011 - Chillicothe, Illinois - Public Screening presented by Chillicothe Public Library - 6:30 pm Chillicothe Library, 430 N. Bradley Ave.
~July 17, 2011 - Richmond, Virginia - Public Screening presented by ChiknEGG Productions LLC - 2:00 pm Byrd Theatre, 2908 West Cary Street. ~June 28, 2011 - Crystal Lake, Illinois - Public Screening co-presented by McHenry County Transition, Enviromental Defenders, and Lou Marchi Total Recycling Institute - 7:00 pm McHenry County College, Conference Center, 8900 US Hwy 14. ~June 20, 2011 - Salt Lake City, Utah - Chicken Week Screening presented by Wasatch Community Gardens - 7:00 pm Salt Lake Film Society's Tower Theatre, 876 East 900 South. ~May 16, 2011 - Phoenix, Arizona - Public Screening presented by Desert Urban Gardens - 8:00 pm, FilmBar, 815 N. 2nd Street. ~May 14, 2011 - Ventura, California - Public Screening presented by Hope Dance Films - 3:00 pm, Ventura Publc Library at the Topping Room. ~April 29, 2011 - Colorado Springs, Colorado - Public Screening presented by the Take-A-Peak Chicken Coop Tour - 7:00 pm H&R Block Office, 816 E Fillmore Street. ~April 24, 2011 - San Luis Obispo, California - Public Screening presented by Hope Dance Films - 4:15 pm, SLO Library, Osos and Palm. ~April 23, 2011 - Madison, Wisconsin - Earth Day Public Screening presented by Madison Public Library - 2:00 pm , Pinney Branch Library, 204 Cottage Grove Rd. Both of the filmmakers will be in attendance to introduce the film and do a Q&A afterward. ~April 23, 2011 - Phillipsburg, New Jersey - Earth Day Public Screening presented by Perfect Christmas Tree Farm - 10:00 am - 3:00pm Perfect Christmas Tree Farm, 999 US 22. ~April 17, 2011 - Santa Barbara, California - Earth Day Weekend Public Screening presented by the Community Environmental Council of Santa Barbara - 3:30pm Alameda Park, Santa Barbara Street. ~April 17, 2011 - Colorado Springs, Colorado - Public Screening presented by the Take-A-Peak Chicken Coop Tour - 3:00 pm Pikes Peak Library District: East Library, 5550 N Union Blvd. ~April 9, 2011 - Bloomington, Illinois - The Illinois Sustainable Living and Wellness Screening presented by the Ecology Action Center - 3:00pm Illinois Wesleyan University Shirk Center, 302 E. Emerson Street. ~April 7, 2011 - Inver Grove Heights, Minnesota - Public Screening presented by Inver Hills Community College - 2:00 pm Inver Hills Community College, 2500 East 80th Street. ~April 4, 2011 - Paso Robles, California - Public Screening at the Book of the Year event presented by Cuesta College - 7:30 pm, Cuesta College North Campus, 2800 Buena Vista Drive. Chicken expert Christine Heinrichs will be present for Q&A. ~April 1, 2011 - Pensacola, Florida - Public Screening presented by Ever'man Natural Foods Cooperative - 6:30 pm Ever'man Co-op, 315 West Garden Street. ~March 27, 2011 - Greenwich, Connecticut - Public Screening presented by Audubon Connecticut - 2:00 pm Audubon Greenwich, 613 Riverville Rd. ~March 26, 2011 - Havre, Montana - Public Screening presented by Yellow Bus Creations - 4:00 pm Montana Academy of Dance Studio, 220 3rd Ave, #401. ~March 13, 2011 - Petaluma, California - Public Screening presented by Daily Acts - 7:00 pm Aqus Cafe, 2nd and H Street. ~February 5, 2011 - Winnipeg, Manitoba - Reel Green Film Festival presented by Manitoba Eco-Network - 3:45 pm Lockhart Hall at the University of Winnipeg, 515 Portage Ave.
~February 5, 2011 - La Crosse, Wisconsin - Public Screening presented by the LaX City Chickens - 3:00 pm People's Food Co-op, S. 5th Street. ~January 27, 2011 - Menasha, Wisconsin - Public Screening presented by the City of Menasha Sustainability Board - 7:00 pm Menasha Public Library, 440 First St.
~January 21, 2011 - Stevens Point, Wisconsin - Public Screening presented by the North Central Wisconsin Master Gardeners, Garden Visions - 6:00 pm Ramada, 1501 N. Point Dr.
~November 20, 2010 - Savannah, Georgia - Public Screening presented by Savannah Urban Garden Alliance - 6:30pm Starfish Cafe, 719 E. Broad Street. ~November 7, 2010 - Alexandria, Virginia - Alexandria Film Festival - 5:10 pm 1605 Cameron St.
~October 31, 2010 - Albany, California - Public Screening presented by Transition Albany - 1:30 pm Albany Library, Edith Stone Room, 1247 Marin Ave.
~October 26, 2010 - Oshkosh, Wisconsin - Public Screening presented by Oshkosh Backyard Chickens and UW-Oshkosh Student Environmental Action Coalition - 3:00 pm Reeve Union Theater, 748 Algoma Blvd. ~October 22, 2010 - Oshkosh, Wisconsin - Public Screening presented by Oshkosh Backyard Chickens and UW-Oshkosh Student Environmental Action Coalition - 7:00 pm Reeve Union Theater, 748 Algoma Blvd. ~October 16, 2010 - Traverse City, Michigan - Great Lakes Bioneers Conference Public Screening presented by Michael Moore and the Great Lakes Bioneers - 7:30 pm State Theatre, 233 E Front Street. ~August 26, 2010 - Lansing, Michigan - Public Screening presented by the Allen Neighborhood Center and The Mid-Michigan Environmental Action Council - Meeting at 7:00 pm, movie at 8:00pm, The Jason Homestead, 1406 Prospect St.
~July 27, 2010 - Providence, Rhode Island - Public Screening presented by Farm Fresh Rhode Island, Local 121, and Whole Foods Market - 7:00 pm Local 121 Restaurant, 121 Washington Street. ~July 9th, 2010 - Madison, Wisconsin - Public Screening presented by the Madison Waldorf School and Troy Community Gardens (as part of the Olbrich Gardens garden tour) - 8:00 pm Troy Gardens, 500 block of Troy Drive. ~June 25, 2010 - Lockport, Illinois - Public Screening presented by Lockport CLUCK - 7:00 pm Central Square Building, 222 E. 9th Street, 3rd Floor. ~June 25, 2010 - Cambridge, New York - Public Screening presented by Hubbard Hall Projects - 7:00 pm Hubbard Hall, Beacon Feed Studio, 25 East Main Street. ~June 18, 2010 - Vancouver, British Columbia - Public Screening presented by Langara College Continuing Studies and Village Vancouver - 7:00 pm Langara College Continuing Studies, 100 West 49 Avenue. ~June 17, 2010 - Sawtell, New South Wales Australia - Public Screening presented by Bellingen Local Food Network and Community Gardens Association - 7:00 pm Sawtell First Avenue Cinema, First Avenue. ~June 13, 2010 - Bellingen, New South Wales Australia - Public Screening presented by Bellingen Local Food Network and Community Gardens Association - 7:00 pm Bellingen Memorial Hall, Hyde Street. ~June 5, 2010 - Dallas, Texas - Public Screening presented by the Dallas Public Library - 1:00pm Jonsson Central Library, 1515 Young St.
~May 13, 2010 - Asheville, North Carolina - Public Screening presented by Mother Hen's Chicken Club - 7:00 pm Lexington Avenue Brewery, 39 N. Lexington Avenue. ~May 11, 2010 - Racine, Wisconsin - Public Screening presented by Belle City Chickens - 7:00 pm Root River Education Center, 1301 West 6th Street. ~May 8, 2010 - Bend, Oregon - Public Screening presented by Celebrate the Season: Your Backyard Farm Center - 7:00 pm Second Street Theater. ~May 7, 2010 - Knoxville, Tennessee - Public Screening presented by Three Rivers Market Natural Food Co-op - 7:00 pm Remedy Coffee House, 125 West Jackson Ave.
~May 1, 2010 - Haida Gwaii, British Columbia - Haida Gwaii Film Festival - 3:15 pm Haida Heritage Centre at Kaay Llnagaay. ~April 26th, 2010 - Sheboygan, Wisconsin - Public Screening presented by Sheboygan Area Local Food Alliance - 6:30 pm Paradigm Cafe, 1202 N. 8th St.
~April 25th, 2010 - Iowa City, Iowa - Public Screening presented by University of Iowa Museum of Natural History - 2:00 pm U of I Museum of Natural History, Macbride Hall. ~April 24th, 2010 - Thunder Bay, Ontario - Public Screening presented by Environmental Film Network - 3:30 pm Lakehead University, Room UC1017 . ~April 22nd, 2010 - Vancouver, British Columbia - Public Screening presented by Langara College Continuing Studies and Village Vancouver - 7:00 pm Langara College Continuing Studies, 100 West 49 Avenue. ~April 21st, 2010 - Santa Fe, New Mexico - Public Screening presented by the Santa Fe Farmer's Market Institute - 7:00 pm Santa Fe Farmer's Market Institute, 1607 Paseo de Peralta. ~April 17th, 2010 - Phillipsburg, New Jersey - Earth Day Public Screening presented by Perfect Christmas Tree Farm - On going day-long event, 999 US 22. ~April 17th, 2010 - Mankato, Minnesota - Public Screening presented by the Mankato Urban Chickens - 1:00pm Bethlehem Luthern Church, 720 S. 2nd Street. ~April 15th, 2010 - Mankato, Minnesota - Public Screening presented by the Mankato Urban Chickens - 6:00pm Center for Earth Spirituality, 170 Good Counsel Drive. ~March 29th, 2010 - St. Louis, Missouri - Public Screening presented by Slow Food St. Louis - 7:30pm Schlafly Bottleworks, 7260 Southwest Ave.
~March 28th, 2010 - Colorado Springs, Colorado - Public Screening presented by Springs' Chickens - 3:00pm Penrose Library, Pikes Peak Library District, 20 North Cascade Ave.
~March 20th, 2010 - Bend, Oregon - Public Screening presented by Celebrate the Season: Your Backyard Farm Center - 5:30pm Second Street Theater. ~March 13th, 2010 - Williamstown, Massachusetts - Farm Film Feast Festival presented by Storey Publishing - 11:30am Images Cinema, 55 Spring Street. ~March 10th, 2010 - Calgary, Alberta - Public Screening presented by CLUCK: Canadian Liberated Urban Chicken Klub - 7:00pm Plaza Theatre, 1133 Kensington Road NW. ~March 6th, 2010 - Baraboo, Wisconsin - Public Screening presented by Wisconsin Humanities Council - 3:30pm Campus Theatre at UW-Baraboo. ~February 24th, 2010 - Thunder Bay, Ontario - Public Screening presented by Environmental Film Network - 7:30pm Confederation College, Shuniah Building Lecture Theatre, Nakina Drive. ~February 21st, 2010 - Dallas, Texas - Public Screening presented by North Haven Gardens - 2:00pm North Haven Gardens, 7700 Northaven Road, Refreshments served. ~February 13th, 2010 - Fayetteville, Arkansas - Public Screening presented by Ozark Natural Foods Co-op - 2:00pm Whitaker Animal Science Arena, University of Arkansas, 1335 W. Knapp. ~February 10th, 2010 - Langley, British Columbia - Green Wednesdays Public Screening presented by Kwantlen Polytechnic University - 7:00pm School of Horticulture, Kwantlen Polytechnic University, 20901 Langley By-Pass. ~February 4th, 2010 - Cumberland, Maryland - Public Screening presented by Maryland Association for Environmental and Outdoor Education - 7:00pm Rocky Gap Resort, 16701 Lakeview Rd. NE, Flintstone. ~January 23, 2010 - Decorah, Iowa - Oneota Film Festval - 9:30am Luther College, 700 College Dr., Decorah, IA. ~December 5th, 2009 - La Crosse, Wisconsin - Public Screening presented by People's Food Co-op - Event starts at noon, show at 12:30pm People's Food Co-op, 315 Fifth Avenue South, Filmmakers are scheduled to attend. ~November 19th, 2009 - Kingston, Ontario - Public Screening presented by Urban Agriculture Kingston - 7:00pm Ellis Auditorium, 58 University Ave.
~November 14th, 2009 - Gainesville, Florida - BIG Chicken Event Screening! - 7:00pm Civic Media Center, 433 S. Main Street, Filmmakers scheduled to attened. ~November 10th, 2009 - Salmon Arm, British Columbia - Public Screening presented by Committee for a Strong, Sustainable Salmon Arm - 7:00pm CASSSA office, 351 Hudson Ave.
~November 7th, 2009 - Bellingham, Washington - Public Screening presented by Pickford Film Center - 12:00pm Pickford Cinema, 1416 Cornwall Ave.
~November 7th, 2009 - Blanchardville, Wisconsin - Public Screening presented by River Valley Trading Company - 7:00pm River Valley Trading Company, 204 S. Main St, Filmmakers scheduled to attend. ~November 3rd, 2009 - St. Louis, Missouri - Public Screening presented by Slow Food St. Louis - 6:00pm Schlafly Bottleworks, 7260 Southwest Ave.
~October 27th, 2009 - Honokaa, Hawaii - Practical Agriculture for Hamakua Screening presented by The Hilo Hamakua Community Development Corporation and Hawaii County Department of Research & Development, Class: A Pastured Poultry Model That Works (first 20 minutes) followed by screening, $12 for both, North Hawaii Education and Research Center, 45-539 Plumeria Street. ~October 22nd, 2009 - Pender Island, British Columbia - Public Screening presented by the Pender Island Film Group - 7:30pm Pender Islands Community Hall, 4418 Bedwell Harbour Rd. ~October 17th, 2009 - Bellingham, Washington - Doctober Film Festival presented by Pickford Film Center - 2:00pm Pickford Cinema, 1416 Cornwall Ave.
~October 17th, 2009 - Vancouver, British Columbia - Stone Soup Food Film Festival presented by Grandview Woodlands Food Connection and East End Food Co-op - 11:00am Britannia Community Centre, 1661 Napier St.
~October 14th, 2009 - Ottawa, Ontario - World Food Day Screening presented by Just Food - 7:00pm (doors open 6:30) Saint Paul's University, Auditorium, 223 Main Street, Public consultation / policy discussion after the film. ~October 10th, 2009 - Seattle, Washington - Public Screening presented by Queen Anne Movie Guild - 7:00pm Queen Anne United Methodist Church, 1606 5th Ave.
~September 28th, 2009 - Columbia, Missouri - Public Screening presented by Ragtag Cinema - 5:30pm Ragtag Cinema, 10 Hitt Street. ~September 23rd, 2009 - Evanston, Illinois - Reeltime Film Series presented by Angelics Organics Learning Center, Evanston Public Library and the Evanston Food Policy Council - 7:30pm Evanston Public Library screening room, Filmmakers scheduled to attend. ~September 22nd, 2009 - Chicago, Illinois - Logan Square Public Screening presented by Angelics Organics Learning Center - 7:30pm Armitage Baptist Church, Filmmakers scheduled to attend. ~September 22nd, 2009 - Chicago, Illinois - Hull House Chicken Talk presented by Angelics Organics Learning Center - Noon Hull House Museum, University of Illinois Chicago, Filmmakers scheduled to lead discussion and present clips from the film. ~September 19th, 2009 - Madison, Wisconsin - Outdoor Film Series presented by Willy Street Co-op - 8:00pm Willy Street Co-op, 1221 Williamson St, Takes place during Willy Street Fair, Filmmakers scheduled to attend. .
~September 19th, 2009 - Walpole, New Hampshire - Feast on This Film Festival presented by TriVillage Energy and Walpole Town Library - 10:00am Walpole Public Library, 48 Main Street. ~September 17th, 2009 - Newburg, Wisconsin - Public Screening presented by the Riveredge Nature Center. ~September 10th, 2009 - San Luis Obispo, California - Outdoor Screening presented by Hope Dance Films and Edible SLO - Begins at dusk, Sally Loo’s Wholesome Cafe, 1804 Osos Street, Chicken author Christine Heinrichs (who's in the film) scheduled to attend. ~August 25th, 2009 - Santa Barbara, California - Public Screening presented by Hope Dance Films - 7:00pm Faulkner Gallery, 40 E. Anapamu Street, Chicken author Christine Heinrichs (who's in the film) scheduled to attend. ~August 15th, 2009 - Madison, Wisconsin - Outdoor Screening presented by Mad City Chickens group - Following coop tour, begins at dusk, 1937 Vahlen Street, Filmmakers scheduled to attend. ~August 14th, 2009 - Ottawa, Ontario - Centretown Outdoor Film Festival presented by Just Food - 9:00pm Dundonald Park (Somerset & Kent). ~August 14th, 2009 - Paso Robles, California - Vinfuzion Public Screening presented by Edible San Luis Obispo - 6:30pm Zinfusion Winery, 2485 Hwy 46 W .
~August 12th, 2009 - San Luis Obispo, California - Public Screening presented by Hope Dance Films - 7:00pm SLO Library, 995 Palm Street, Chicken author Christine Heinrichs (who's in the film) scheduled to attend. ~August 11th, 2009 - Toronto, Ontario - Public Screening presented by Toronto Chickens - 7:30pm Hart House, University of Toronto. ~August 9th, 2009 - Sacramento, California - Movies on a Big Screen presented by CLUCK Sacramento - 7:00pm Guild Theater 2828 35th Street. ~August 9th, 2009 - San Francisco, California - Public Screening presented by Slow Food San Francisco - 6:00pm Delancey Street Theater 600 Embarcadero, Tapas and wine to follow, Filmmakers scheduled to attend. ~August 9th, 2009 - Dallas, Texas - Public Screening presented by North Haven Gardens - 1:00pm North Haven Gardens, 7700 Northaven Road, Refreshments served. ~August 8th, 2009 - Dallas, Texas - Public Screening presented by North Haven Gardens - 2:30pm North Haven Gardens, 7700 Northaven Road, Refreshments served. ~August 8th, 2009 - Davis, California - Public Screening presented by the Davis Food Co-op and Slow Food Yolo to benefit the Davis Farm to School Connection - 6:30pm Reception with the filmmakers in attendance followed by the screening at 8:00 pm, Richard Brunelle Performing Arts Theater, 315 E. 14th St.
~August 7th, 2009 - Sacramento, California - Movies on a Big Screen presented by CLUCK Sacramento - two showings 7:00pm & 9:30pm Guild Theater, 2828 35th Street, Filmmakers scheduled to attend. ~August 6th, 2009 - San Anselmo, California - Sustainable Film Festival presented by Sustainable Fairfax and Permaculture Marin - 7:00pm Drake High Little Theatre, 1327 Sir Francis Drake Blvd., San Anselmo, Filmmakers scheduled to attend. ~July 25th, 2009 - Portland, Oregon - Public Screening presented by Growing Gardens - 8:00pm :vendetta (note colon is part of name), 4306 N. Williams. ~July 25th, 2009 - Ojai, California - Public Screening presented by Ojai Valley Green Coalition - 4:30pm Ojai Theater, 145 E. Ojai Ave.
~July 11th, 2009 - Ann Arbor, Michigan - Outdoor Public Screening presented by Transition Ann Arbor - 8:30pm Old West Side. ~June 28th, 2009 - Cedar Rapids, Iowa - Public Screening presented by Cedar Rapids Chicken Chat group and the Indian Creek Nature Center - 2:00pm Indian Creek Nature Center, Filmmakers scheduled to attend. ~June 27th, 2009 - Iowa City, Iowa - Iowa City Environmental Film Festival presented by IC Friends of Urban Chickens - 1:30pm Rec Center Social Hall, 220 S. Gilbert St, Filmmakers scheduled to attend. ~June 23rd, 2009 - Kansas City, Missouri - All Souls Documentary Film Series presented by Kansas City Center for Urban Agriculture - 7:00pm All Souls Unitarian Universalist Church, 4501 Walnut St.
~June 18th, 2009 - Vancouver, British Columbia - Public Screening presented by Village Vancouver - 7:30pm Langara Collage, 100 W 49th Ave.
~June 17th, 2009 - Northampton, Massachusetts - Public Screening presented by Pioneer Valley Backyard Chicken Association and the Friends of Forbes Library - 7:00pm Forbes Library, 20 West St.
~June 15th, 2009 - Seattle, Washington - Public Screening presented by Sustainable West Seattle - 7:00pm Youngstown Cultural Arts Center, 4408 Delridge Way SW.
~June 12th, 2009 - Seattle, Washington - Friday Night at the Meaningful Movies presented by Wallingford Neighbors for Peace and Justice - 7:00pm Keystone United Church of Christ, 5019 Keystone Place N., Filmmakers scheduled to attend. ~June 9th, 2009 - Glendale, Wisconsin - Public Screening presented by North Shore Library Association - 6:00pm North Shore Library, 6800 N. Port Washington Rd., Filmmakers scheduled to attend. ~May 28th, 2009 - Baraboo, Wisconsin - Public Screening - 6:30pm Baraboo Arts Center, Filmmakers scheduled to attend. ~April 22nd, 2009 - Milwaukee, Wisconsin - Spring Film Festival presented by the Outpost Natural Foods Cooperative - 7:30 pm Lakefront Brewery Palm Gardens, 1855 Commerce Street. Filmmakers scheduled to attend. ~March 10th, 2009 - Monona, Wisconsin - Green Tuesdays Film Series presented by Monona Natural Step - 6:30pm Monona Public Library. Filmmakers scheduled to attend. ~April 3rd, 2008 - Madison, Wisconsin - Wisconsin Film Festival - 9:00 pm Monona Terrace Convention Center. Filmmakrs scheduled to attend.